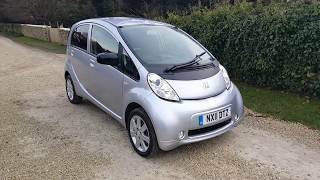 Peugeot iOn 2011 is the 100% electric full size car with range of 150km per charge making it perfect for urban runabout, silent and zero-emission operation. The running costs for the new iOn 2011 is between €1.50 and €2.00 per 100 km. It takes about 6 hours for full charge using a traditional household socket. Anticipated, dreamed about, the first of a newgeneration of 100% electric full size cars is here. Peugeot is making it available not just for a few intrepid adventurers, but for a wide customer base made up of private individuals, professionals and public services, all of whom are convinced and resolved to take together the first step towards a new type of mobility. The 100% electric Peugeot iOn, urban runabout, easy to operate, silent, safe, connected, comfortable and easy to drive with a range of Peugeot Connect services, lets you get around town in a way that's different and sustainable. The environmental awareness expressed by governments, local authorities and citizens, combined with the development of new energy storage technologies, today gives the electric vehicle a new opportunity to put down roots in cities and their outlying areas. Peugeot, the world leader in electric vehicles in terms of the number of Electric 106s it sold, takes a new step in emissions reductions by marketing the Peugeot iOn, the first new-generation 100% electric vehicle. The Peugeot iOn, designed as the ideal car for the city and the suburbs, is targeted mainly at public services and businesses, but also at private individuals. This city run around combines remarkable packaging with good interior space, unrivalled handling, rigorous safety, and a high level of comfort enhanced by a generous standard specification. Added to this are the advantages inherent in electric technology, namely unprecedented silence, the absence of CO2 emissions and superb driveability. To drive the Peugeot iOn means to experience a new tranquillity engendered by the car's silent operation, the absence of vibrations from the power train and the simplicity of no gear changes. What's more, the immediate availability of maximum torque allows efficient, linear acceleration that makes driving in traffic so much easier. Thanks to the energy management of its Lithiumion battery and optimised energy recovery during deceleration and braking, the range as per the European standard cycle is 150 km. In practical terms this is sufficient to cover the majority of a motorists' daily trips, 90% of which are in fact less than 60 km. It takes 6 hours to fully recharge the battery using a traditional household socket. A quick charge using a special charging unit provides a 50% charge in only fifteen minutes, or 80% in thirty minutes. Bearing in mind that a conventional car is at a standstill for around 90% of the time when used in an urban or semi-urban context, the time needed to recharge the Peugeot iOn is entirely compatible with what motorists are used to. With running costs between €1.50 and €2.00 per 100 km, the energy bill of the Peugeot iOn is unbeatable regardless of which recharging mode is used.Carried out overnight or during "off-peak hours" recharging costs can be reduced further and help optimise the use of available power produced by the electricity supply companies. Its standard equipment - six air bags, ESP, electronic brake force distribution (EBFD), emergency brake assist (EBA) - and the design of its structure, gives the Peugeot iOn the same level of safety equipment as a conventional modern car. At the design stage, strong emphasis was laid on the safety and durability of components of the electric power train. The battery components are contained in a rigid, hermetically-sealed casing ideally positioned under the passenger compartment floor for maximum protection in the event of an impact, in the area most resistant to deformation. This also improves the vehicle's weight distribution by lowering the centre of gravity. Recharging of the battery, either by a special quick charge unit or by means of a standard electrical socket using a special connecting cable, is controlled automatically according to the monitored parameters of the individual battery cells. 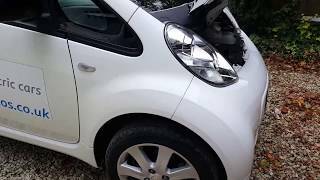 In addition to the latest-generation electric technology, the Peugeot iOn incorporates the most recent telematics technologies to offer a range of Peugeot Connect services. All Peugeot iOn models, as standard and for an unlimited period, have access to Peugeot Connect services including Peugeot Connect SOS and Peugeot Connect Assistance. If safety items are activated or the SOS button is pressed, the car's occupants are put in touch with the emergency call centre. Similarly with Peugeot Connect Assistance, pressing the "Peugeot Lion" button automatically connects the user with the help line. As the vehicle's precise location is determined automatically, emergency or repair services can quickly be dispatched to the scene. Electric Driving, allowing the user to check, via Smartphone or PC, the battery charge status and range of the vehicle. information search by points of interest. With a single badge level and two interior ambiences, the Peugeot iOn range is simple and transparent. Marketing of the Peugeot iOn is based mainly on an "allinclusive" mobility offer. As an example: in France this offer lasts for five years and costs €499 including VAT per month, which includes: the vehicle and its battery - 5 year warranty covering the battery and electric power train - servicing and maintenance for five years or 50,000 km - specific electric assistance - Peugeot Connect, Electric Driving services and access to the Mu by Peugeot mobility programme. Local authorities and governments are in favour of integrating this new technology with state aid and by installing a programme for a re-charging infrastructure. These authorities are also potential customers with their own fleet of vehicles and car-share projects which are envisaged in several cities. To date Peugeot has already signed fifteen letters of intent with mobility operators, energy companies, leasing and car-sharing companies in a number of European countries. From the numerous contacts from private individuals received on the special Peugeot iOn website, these individuals are also interested in 100% electric technology when it is proposed by an established manufacturer such as Peugeot. Within the Mu by Peugeot network, the first mobility service offered by a manufacturer, Peugeot iOn will be one of the vehicles available for short term loan. Individuals will therefore be able to try out this new way of getting around town or choose a zero emissions car for a timely trip. in addition to the Peugeot iOn, the Marque will be putting on sale a 100% electric light commercial vehicle, based initial on the current Partner Origin. 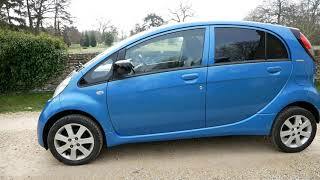 iOn will, therefore, not be the Marque's only electric vehicle. The first 100% electric LCV will be a Partner Origin developed by Venturi but for the longer term, work is underway to create new concepts adapted to 100% electric technology. The success of the European electric vehicle market will be very dependent on tax incentives at the time of purchase or during ownership, the introduction of infrastructures, possible ecological constraints in terms of urban traffic and the fluctuating price of fossil fuels. The market is expected to grow very gradually, representing around the year 2020 4% to 5% of the European car market.For this reason the Peugeot iOn will also appear gradually, rising to a total production of 50,000 iOns by the year 2015.
six energy companies in six European countries. Peugeot is also a partner in the consortium VTLIB' (Veolia urban transport), still in the running as a candidate for the Autolib' project, a future electric car self-service system planned for Paris and nearby suburbs in 2011. To a lesser extent, private individuals are also target customers. Convinced of the Marque's reliability, they will be the forerunners of this new relationship with the motor car. For the first time in the Marque's history a vehicle will display a specific badge, the new pearlescent white/ chrome Lion will be a special feature of zero emission vehicles. This badge affixed to the bonnet of the Peugeot iOn, on the black lacquered moulding of the tailgate and in the centre of all four wheels is supplemented by the logo "Full Electric" on the rear wings. With its single compartment body shape and minimal overhangs the Peugeot iOn is clearly a compact city run about. Its easily identifiable style will quickly be associated with its technological uniqueness and, for the driver or business it will create a modern image of good citizenship, pioneering 100% electric technology. Curvaceous with a small domed bonnet (specific to the iOn) extended by a large inclined front windscreen, the general look of the Peugeot iOn is immediately inviting. Without taking itself too seriously, it adds to this look with full body-colour paintwork and alloy wheels. Seven body colours are available: two pearlescent, two metallic and three vibrant, fun shades. The interior, purposely traditional, is available in two levels of finish, the first understated and consensual, the other featuring materials that are soft to the touch, such as the leather steering wheel and gear lever knob (DNRP) or the soft painted fascia panel and door panels, partially tinted with a subtle hint of very chic metallic blue. The magic of electric power resides in zero CO2 emissions and an external noise level limited to the sound of the tyres on the road, ideal qualities for driving in built-up areas. Thanks to a wheelbase of 2.55 m and its high architecture, its remarkable interior space allows four adults to be seated in comfort. Its compactness - 3.48 m long and 1.47 m wide -, its remarkable turning circle of 4.50 m and its electric power steering make it very agile. It can weave in and out of traffic and make child's play of the most difficult parking manoeuvres. Despite its small size, it commands respect when in amongst the traffic. There can be no doubt that at the wheel of the Peugeot iOn, with its raised driving position and good visibility, both driver and passengers are safe and secure in a real car. As soon as the wheels start to turn, the silence of the power train immerses the driver in the new experience of tranquil driving. Driving, not only silent but also extremely easy, makes journeys less tiring and more fun, with all occupants able to enjoy a normal conversation. A new link between the driver and the vehicle is created by the presence in the instrument panel of a power meter, indicating instantaneous energy consumption or energy recovery (when the foot is taken off the accelerator and when braking). The driver quickly gets used to ensuring optimal energy recovery during deceleration and as a result adopts a fluid, stress-free driving style. 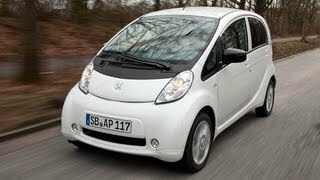 While lending itself to tranquil driving, the Peugeot iOn is not lacking in character and performance. As soon as the need is apparent, use of the accelerator frees up available torque instantly for rapid, linear acceleration. Taking 3.5 seconds to go from 30km/h to 60km/h (compared to 3.9 secs in 3rd in a 207 1.6 litre THP) is evidence of this. This level of performance instils confidence particularly when joining fast moving traffic. Thanks to the vehicle's tall architecture, the battery pack (all battery components) can be housed under the floor between the wheels, which by lowering the centre of gravity gives the vehicle good dynamic stability. This stability is enhanced further by its standard equipment - ESP, electronic brake force distribution (EBFD) and emergency brake assist (EBA). When the driver lifts their foot from the accelerator pedal, the momentum of the wheels drives the electric motor (in reverse direction) in electricity-generating mode, providing "engine braking" comparable to that of a conventional vehicle. Braking efficiency is ensured both by energy recovery and the traditional braking circuit. An electric pump creates a vacuum in the brake servo to assist braking. The same level of safety as a conventional modern car is provided through the design of its structure and its safety equipment: two front air bags, two chest air bags, two curtain air bags, two Isofix child safety seat mountings and an unfastened seat belt warning system for the front and rear seats. The battery pack, positioned in the most impact resistant area, is encased in a structure constructed from a fibreglass reinforced polymer and steel plates. Transverse reinforcement bars in the battery pack protect it in the event of a side impact and improve the rigidity and torsional strength of the chassis. Each of the battery cells (88 in total) are enclosed in a parallelepiped stainless-steel case.They are arranged in groups of four or eight in protected modules, positioned in the pack's structure. In the event of a collision, a short-circuit protection system isolates the cells and "high voltage" circuits. Normal recharging by means of an earthed household electrical socket is carried out using a special cable with a protective housing which electronically controls continuity of the earth line and can therefore interrupt charging in the event of a fault. Recharging, rapid and normal, is monitored by voltage and temperature sensors on the battery cells and by the dialogue between the specific battery pack controller and that of the quick-charge unit via the vehicle's electronic control unit (the car's "brain"). During rapid recharging, if certain temperature thresholds are reached in one or more elements of the battery, the inside of the battery is cooled by the circulation of ambient "cold" air, or air cooled by the air conditioning, in the battery pack. Recharging is possible only if the gear selector is in the parking position. Similarly, the vehicle's ignition is switched off, making it impossible for the car to be started inadvertently with the charging connector in place. The Peugeot iOn is equipped with a new-generation Lithium-ion battery with an energy storage capacity well in excess of the old Ni Cd batteries used in the 1990s (three times more energy per kg or twice as much by unit of volume). This battery has no memory effect. It can be recharged, even partially, without the need for regular complete discharges. The battery can be fully recharged in six hours using a single-phase 220 V household supply via a five metre cable fitted with a standard socket and a special plug for connection to the vehicle. For normal charging the driver connects the cable to the household socket or to a standard roadside charging point, while the other end is connected to the socket on the right-hand side of the vehicle (the socket on the left-hand side is reserved for quick recharging). A symbol on the instrument panel and a LED on the cable's protective housing signal immediate commencement of the battery charging process.It stops automatically when the battery is fully charged. A quick recharge by means of a special recharging unit connected to a three phase 380 V electrical supply takes fifteen minutes to provide 50% battery capacity and 30 minutes for 80% capacity. The special cable for quick recharging, rigidly attached to the terminal, is connected to the socket on the lefthand side of the vehicle. The recharging process is monitored and controlled by the dialogue between the vehicle's electronic control unit and the charging unit controller. Recharging stops automatically when 80% of the full charge is attained (100% is possible with a second re-charge). The aim of the designers was to create an entirely new vehicle in technological terms, but one that was in keeping with what motorists are currently used to. Therefore the driver occupies a traditional driving position with controls comparable to those found on a conventional vehicle: ignition key, hand brake, four-position gear selector and two pedals as on an automatic car, as well as heating and air conditioning controls, etc. Turning the ignition key to the first notch supplies the car's equipment, turning it to the second notch makes the power train operational. The "Ready" light on the instrument panel, accompanied by an audible warning to break the silence, announces that the vehicle is ready to be driven. the vehicle comes to a complete stop when the minimum battery level is reached. 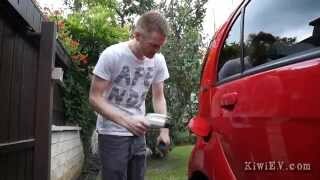 The Peugeot iOn is a rear-wheel drive vehicle in which the electric motor and single-ratio reduction gearbox are installed in front of the rear suspension. The motor is supplied with a 330 V three-phase alternating current (AC) from the inverter which is supplied with a 330 V direct current (DC) from the main battery pack. The inverter regulates the current, frequency and voltage according to the position of the accelerator pedal. The controlled response when the accelerator is pressed has been designed to ensure a good distribution of power when required. The inverter, the motor and the reduction gearing provides a potential speed range from 0 to 130 kph. The single reduction gear provides an overall ratio of 6.066 in both forward and reverse gears. Reverse gear is obtained by reversing the direction of the motor's operation. on the outside, a fixed stator composed of coils supplied by three independent current phases, creates the magnetic field which turns the rotor. The lithium-ion battery was developed by Lithium Energy Japan (LEJ - joint venture Mitsubishi/GS-Yuasa). They are produced (in Kusatsu in Japan) in the world's first factory dedicated to the mass production of lithium-ion batteries for electric vehicles. The term lithium-ion covers several technologies. The choice of manganese oxide technology (cathodes with a manganese oxide LiMn2O4 base) is the best option to meet the operating requirements and required safety levels set for the vehicle. Each battery module has four or eight 3.7 V cells and a capacity of 50 Ah. With a total of 88 cells, connected in series, the battery pack can store 16 kWh of electrical energy with a nominal voltage of 330 V.
The recharging of each cell in the battery pack is controlled continuously by a control system which includes monitoring of each cell and a central battery controller. The electrical air conditioning and heating systems of the passenger compartment are powered from the lithium-ion battery pack. The heating system operates via the circulation of coolant which is electrically heated. It provides warm air immediately after a cold start or when the vehicle is at a standstill. The power of the heating can be adjusted to obtain just the right level of comfort in order to minimize the consumption of electricity. An optional "cold pack" is available which includes a heated driver's seat ensuring good thermal comfort when only the driver is present, and optimising the energy usage for the heating of the passenger compartment. Air conditioning is provided by a refrigeration unit with an electric compressor controlled electronically so that only energy required for the current setting is consumed. When the car is being driven, the inverter transforms 330 V direct current (DC) from the battery into 330 V alternating current (AC) to supply the electric motor. It also controls the electric motor depending on the position of the accelerator and during the energy recovery phase. The motor is reversible. During deceleration it generates alternating current (AC) which is converted by the inverter to direct current (DC) in order to recharge the drive battery (generator mode). The on-board charger transforms household 220 V alternating current (AC) into 330 V direct current (DC) to recharge the drive battery. It controls the 14 A input current and the 8 A current supplying the battery. For quick charging, the 50 kW charging unit directly supplies voltage and direct current to recharge the drive battery. The unit operates on a three-phase 380 V supply (supplied directly from the country's electrical network). The car's battery is, therefore, supplied with a single-phase direct current of up to 125 A. Recharging is monitored and controlled by the dialogue between the vehicle's electronic control unit and charging unit.Recharging stops automatically when 80% of the full charge is attained. A second recharging phase can be started (after the first 80%), and will continue up to 100% but more slowly, in order to not exceed the maximum voltage of each battery cell. A (DC) converter incorporated into the on-board charging unit generates a 14 V supply from the 330 V of the drive battery to recharge the 12 V battery supplying the car's equipment - ECUs, lighting, audio system, power steering, vacuum pump, water pump, etc. It plays the same role as the alternator on an internal combustion engined vehicle. When the car is being driven, the electronic control unit continuously monitors correct operation of the vehicle and controls energy management. Work was carried out in particular to optimise performance and encourage energy recovery during braking. Regardless of road conditions and battery charge levels, the vehicle controller determines the motor's operating performance. The battery has its own checks for phases of recharging, discharge linked to the vehicle's electronic control unit. The inverter, on-board charger, (DC) converter and electric motor are cooled by circulating water supplying a radiator positioned at the front of the vehicle. To optimise the life of the battery, if certain temperature thresholds are reached by elements of the battery pack during quick charging, ambient air or air cooled by the air conditioning is circulated through the pack.